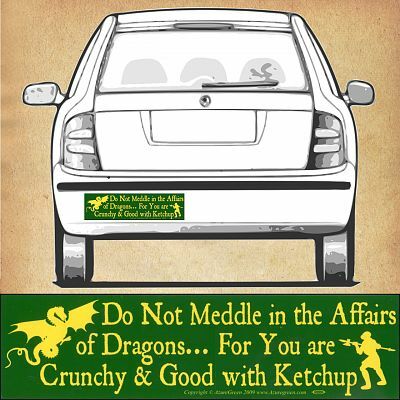 - Text reads: "Do Not Meddle in the Affairs of Dragons… For You are Crunchy & Good with Ketchup". And let's face it, it's hard to argue with such stellar advice. In fact, I suspect the world would be a happier place with more dragons, and less meddling. You'll have other drivers laughing and nodding their heads in agreement with this funny bumper sticker. "Do Not Meddle…" bumper sticker measures 11 1/2" by 3". This high quality vinyl decal is resistant to UV and water, and is made to last. This is, hands-down, the most popular bumper sticker we sell. Give everyone a piece of your mind as you drive down the road. Bumper stickers are the perfect little bits of wit and wisdom to share with the world. Do you have any other questions about our "Do Not Meddle…" Bumper Sticker? I have been looking for this for 6 years! I love the bumper stickers, the site, the patterns, the buttons. Highly recommended for great things with fast shipping! i love this sticker, i thought it meant something different at the time of purchace but i now know it means ill just eat you with catchup if you piss me off! hahahahaha mine is green with white letters and dragon and knight. by the way, i chose 5 moons cause its not working on the page. I had this bumper sticker for a few years and had to have my bumper replaced on my car and lost my dragon bumper sticker. I finally found it on Gryphon's Moon and was delighted. I got the sticker within a week and I loved the colors. it worked well, and was sooo funny! It's cute, funny...& mostly very true. I love dragons. I collect dragons of all kinds. If you think you're not crunchy, just ask a bearded dragon!! Great message! Fits my personality rather well. I am a reptile keeper, bearded dragons........so we especially love this sticker!